I love the variety of stitching and change in thread weights, both machine and hand. Small projects are a lot less scary to try new techniques on (and are super satisfying as finishes). It's lovely, Jess! This is awesome! I love the idea of using the tucks as an opportunity for a design element rather than trying to eliminate them. I definitely had this issue when working with some wonky blocks a while back. I think it may be one of my favorites this year too! Gorgeous design Jess! The take on the traditional is amazing, the quilting is fabulous but the addition of the hand quilting puts it over the top for me! Congrats...very well done! Very interesting take on an old classic. Lovely, and full of color. Love the way you approach your quilting ideas so fearlessly. That's a huge lesson for me to take to heart. Way cool, Jess! I don't think I'd ever take on a cathedral window, but this. . ! I love this. It is prettier than the "old classic"
Wow what a great go at that hard block. I love your interpretation of it in improv. Very modern! And what a lot of detail and variety has gone into this quilt! Great finish! When I saw this quilt in my Bloglovin' feed a few days ago, it stopped me in my tracks. There are so many great things about it, but it's the piecing that won my heart. I, too, like quilts that are cut into and changed -- you never know what the end result will be until you get there! The textured quilting is a bonus to an already awesome project. Is it one of your best finishes of 2016, though? I have to vote it is *the* best. I've never made cathedral windows. I like your improv version. 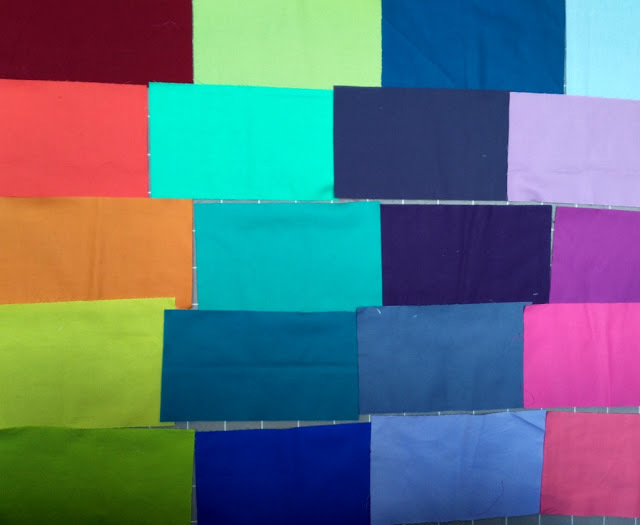 Thanks for linking up with TGIFF hosted @ Anja Quilts. This quilt is very 'you'! I love small projects too and the mix of hand and machine quilting is really fun. great quilt - i love its wonkiness and the texture of the various stitching. the women of gees bend took tucks in their quilts too, and theirs are my favorites. yours is right up there with them. what size is it? Thanks so much! I couldn't locate your email so I hope you see my response here. Oh, I love the quilts from Gee's Bend - that's so cool and I'm honored to be compared (I hardly think I'm worthy!). It's 29" x 24". 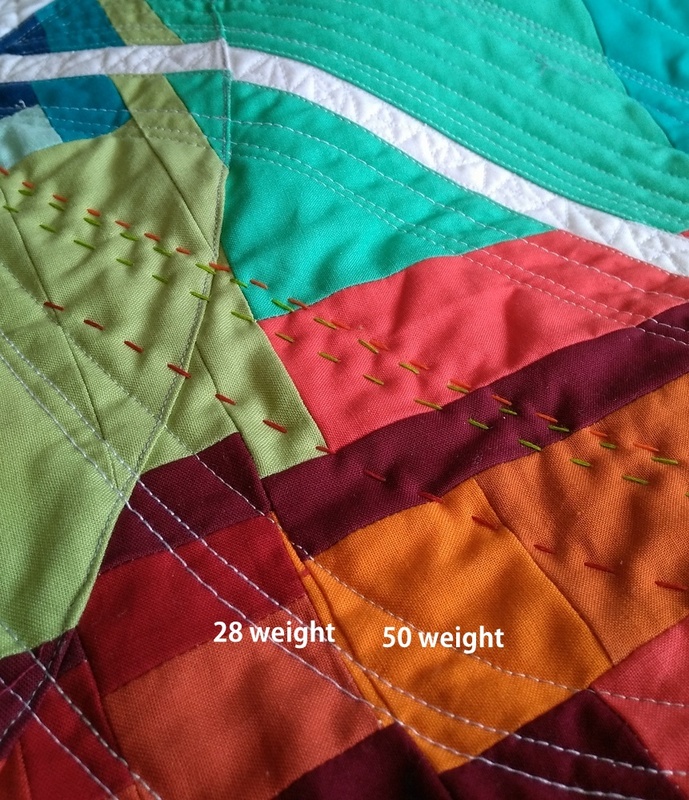 Ooh I love how much movement this quilt has from the piecing and quilting! Love this quilt. Love your ideas and sense of color. Really hoping to get my guild to get you up here to the Berkshires!! Hi Michelle, I could not locate your email so I hope you see my reply here. :) Thank you for your kind words! This one is a favorite of mine. I'd absolutely love to come and visit your guild! Please feel free to contact me via email or my inquiry page with more information. Thank you!